It's the difference between cancer and health. Add oxygen and everything changes! Cancer is said to have countless causes - smoking, toxins, a genetic cause, a cause linked to abnormal protein production, an environmental cause, and a host of other factors. This is in all likelihood true, but it causes one to tend to miss the point. Cancer is a abnormal body process which occurs in response to numerous causes, all of which affect the cell's ability to extract energy from food. The primary cause of cancer is due to damage to the energy mechanisms of the body. In 1931 Otto Warburg received the Nobel Prize for his demonstration that cancer cells utilize a process known as glycolysis (glyco=sugar, lysis=split) as their chief means of energy production, rather than the more energy efficient oxidative respiration, as in normal human cells. Warburg hypothesized that cancer, malignant growth, and tumor growth are caused by the fact that tumor cells mainly generate energy by non-oxidative breakdown of glucose. 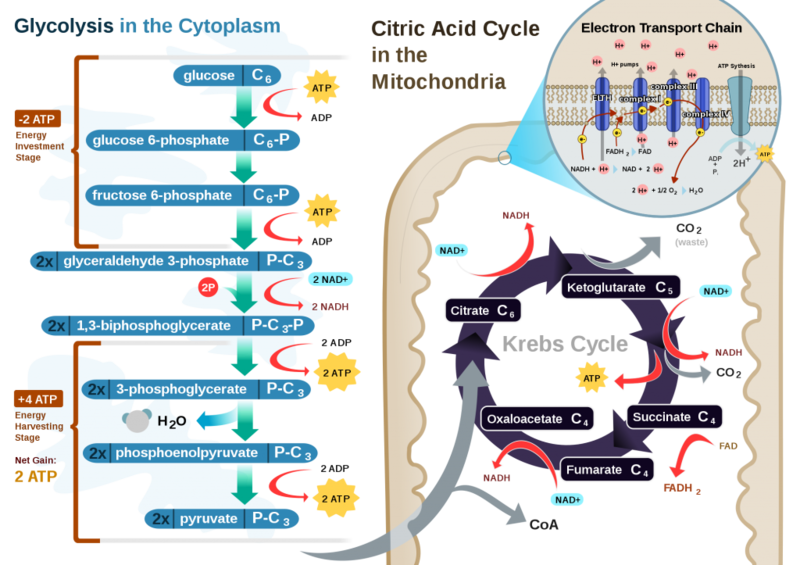 This is in contrast to normal cells, which mainly generate energy from the oxidative breakdown of pyruvate, which is the end product of glycolysis. Warburg stated that as the first priority of treatment was that "all growing body cells be saturated with oxygen" and the second priority was to avoid further exposure to toxins. When damage begins to occur, the human body forms “transitional” tissues which, although normal in appearance under the microscope, are metabolically “cancerous,” in that they have been forced to utilize glycolysis as their major means of energy production, but they have not yet suffered additional, severe damage. These “transitional” tissues can ‘come and go'. 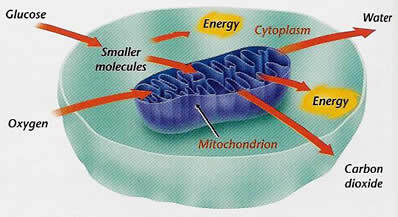 If the energy producing mechanisms in the cell (mitochondria) can be repaired, the cell will return to normal function. If the mitochondria cannot be repaired, the cell will be forced to continue to extract energy through fermentation rather than respiration. In this state, the cell can continue to function, but in a much weaker, energy-poor state. It is clear that any "cure" for cancer must provide repair and support for the energy extracting processes of all cells, rather than merely attempt to "kill" the cancer cell. We need to support and repair our mitochondria, not kill them. Don't let the complexity of the diagrams below confuse you. through the process known as respiration. 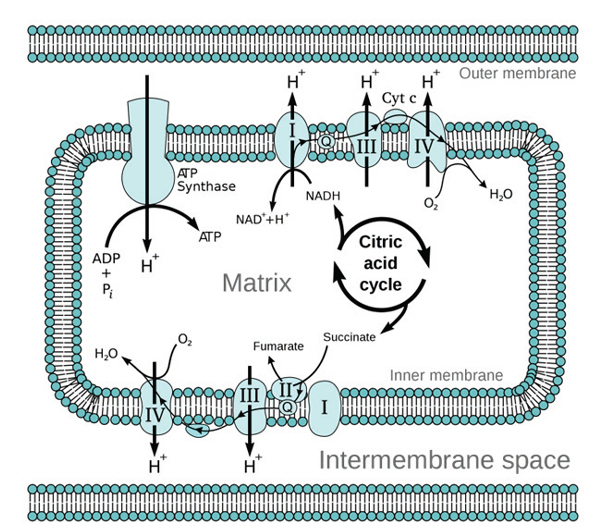 When oxygen is present, the mitochondria will extract energy from glucose and oxygen via aerobic respiration. However, if oxygen is not present, only glycolysis and fermentation will occur. In the presence of oxygen, glucose is completely broken down into H2O and CO2. 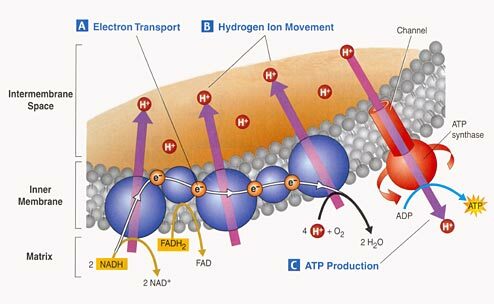 Two molecules of ATP (energy) are required to get the energy mechanism started. Glycolysis of glucose yields 4 molecules of ATP for a net gain of only two molecules of ATP (not very powerful). Biology textbooks often state that 38 ATP molecules can be made from each glucose molecule during cellular respiration (2 from glycolysis, 2 from the Krebs cycle, and about 34 from the electron transport system). However, this maximum yield is never quite reached due to losses (leaky membranes as well as the energy used to move molecules). Current estimates range around 29 to 30 ATP per glucose, thus respiration is about 15 times more efficient than glycolysis. Don't let the complexity of the above diagrams confuse you. to be able to produce energy (ATP) through the process known as respiration.